The die on the right is just a shade lighter than the one on the left (in person the difference is much more pronounced), but they're both Munchkin 6-siders, right? Well, while the lighter one can be found in +6 Bag O' Munchkin Rainbow d6, the darker one can be found in . . . Awful Green Things From Outer Space. No, that's not a Munchkin product. 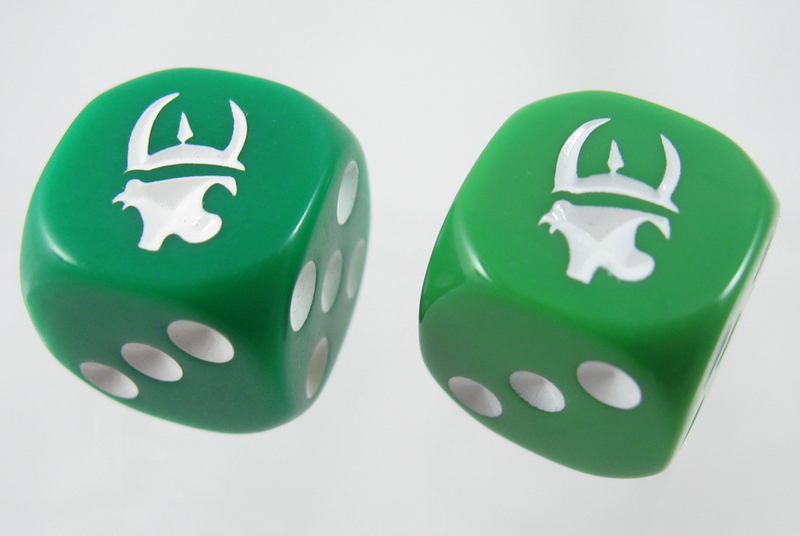 Apparently we print so many Munchkin dice that when we tell the printer "standard dice," they assume we mean the one with the Munchkin head on it. The die color found in AGT is absolutely unique -- no other Munchkin die that we've produced matches it. So if you're a completist (and I'm looking at you, Jan!) you'll want to either pick up a copy of AGT or trade some mundane dice with a fellow gamer who owns a copy. Of course, if you simply love good games with tons of replay value, you'll want AGT in your library no matter what color the dice are.